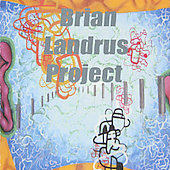 When elements of R&B, Hiphop, Free Jazz, and straight-ahead jazz are brought together along side quality performances what you get is the decidedly modern album “Brian Landrus Project”. From the moment you press play this album will surprise you with its driving rhythm section and DJ scratching funky patterns on top of the danceable beat. For all that this album is, there are a few things that it is not. Let’s start with what this album is not. It is not a baritone saxophone heavy album. If I remember correctly there are only 2 songs in which Brian is playing improvised solos on Baritone. This is a bit of a shame in my opinion but when he does play bari it has a huge sound fills the audio space with the tone. The bulk of this album is Landrus on Tenor sax or flute.This album is also not like the others in the sense that it has a strong sense of collaboration and less of a sense of a soloist and his band. If it isn’t all of that then what is it? This album is a emulsion of traditional jazz, hiphop, R&B, rock and elements of free jazz. Landrus choose to include elements of popular music that aren’t usually thought of as jazzy. The inclusion of DJ scratching rhythms along side the rhythm section adds a urban rawness that isn’t present in “legit” jazz.. There are also elements of late Miles Davis’esque audio effects on tracks like Organ Donor. As a huge fan of Esperanza Spalding, well fan may be a bit of an understatement, I was excited when Landrus started playing with her. Until he started playing with her I was only familiar with his later albums and didn’t quite get where his background in R&B and funk came from. This album shows that he’s had it in him from the early days. Tracks like Soul Sauce, The Search, and Spur have a funky soul that is impossible to ignore. Recently I had emailed Brian to see how the Esperanza Tour was going and to let him know I’d be talking about this album. We exchange emails every so often when his schedule has breaks. On the mention of this album he encouraged me not to buy it. He implied that it wasn’t his favorite. This had a huge reverse-psychological effect on me. At that point I had to listen to this album, after all what does this great musician have to hide? In my opinion nothing, he displays youth and exuberance and that makes this album just enjoyable to his later ones only in a different way. TAKE AWAY: If you have listened to his later albums then you may not recognize the proto-Landrus on display in this album. Tons of passion and drive but not the same polish of his later baritone focused albums. In some ways this album is ahead of its time while also being a product of its time. I do suggest you purchase this album as MP3’s to save a few dollars you can then use to get his 2013 album Kaleidoscope.